Thousands of people are expected to travel to the city next week for the annual Galway Solemn Novena. Now in its 38th year, over 300 volunteers, 12 Redemptorist staff and 10,000 pilgrims will take part in the Galway Novena from February 18-26 at Galway Cathedral. This year’s Novena will reflect on the Joy of Love and Family Life Today, with weekday masses starting early at 7:30am. After serving for eight years as the Rector in Esker and Director of the Galway Novena, Fr Brendan O’Rourke will be finishing his time in those roles this March. His replacement will be announced by the Redemptorist Provincial in a few weeks. 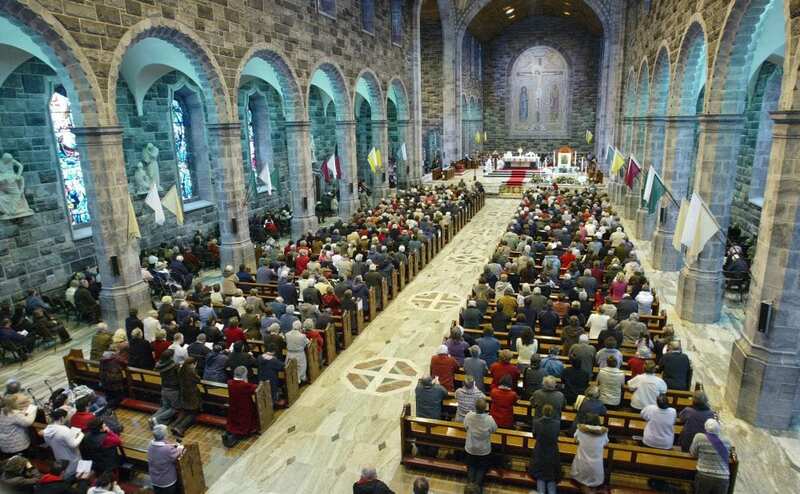 The large congregation during the Novena at Galway Cathedral. Discussing the main theme of family at this year’s Novena Fr Brendan said its important that the message reflect realistic family life today. “We all know that no family is perfect and each family has its joys and struggles,” Fr Brendan said. Preachers for the Novena will include Fr Tony Rice from Belfast, Fr Denis Luddy from Cork, Fr Gerry O’Connor from Limerick City and Environmental scientist Neil Foley from Wexford. Neil’s latest collaborations are on the Hook of Faith digital evangelisation project with The Mustard Seeds contemporary worship group. Married to Helen he has a certificate in Pastoral Theology and works as an environmental scientist. Weekday Mass times at the Cathedral are at 7:30am, 11am, 1:10pm, 3:30pm, 7:30pm, and 9pm. On Sunday mass will be said at 9am, 10:30am, 12:30pm, 4:30pm, 6:30pm and 8pm. Children will be blessed after each session on Sunday February 24, and the annointing of the sick will take place at 11am on Saturday, February 23. Candle Light meditation sessions will take place at 10pm on Wednesday 20 and Monday 25 and last about an hour. The communal Sacrament of Reconciliation will take place on Thursday 21 in three sessions at 7.30am, 1.10pm, and 9pm. One thing that people highlight about the Solemn Novena is that it is an event that brings the community together, to share joys and struggles and support one another. The hymns on the playlist for 2019 will be performed by Galway Cathedral Organists and cantors from the Redemptorist Novena team. At each of the two late night sessions there will be live music and reflections that are meant to create a relaxing environment for people to reflect in. All collections from the Thursday 21st February masses (11am, 3.30pm and 7.30pm) will be donated to Galway Hospice, Irish Guide Dogs and SERVE. The Gaol road to the rear of the Cathedral will be closed to all traffic for the duration of the Novena, people are advised to car pool where possible. For more information log onto www.galwaycathedral.ie or check out Galway Cathedral across all social media platforms.